GardenGrocer.com obtains nutritional information from claims made by the products' manufacturers on labels. We have made every effort to be as accurate as possible; however we do suggest that you continue to read labels as ingredients are subject to change and we cannot be responsible for individual reactions to any products. We do not investigate to determine if the label information is accurate. We do our best to record the information as it appears and keep nutritional content information current, but there are thousands of products in our store, manufacturers frequently change formulations, and we may not notice when a manufacturer changes the nutritional claims on a product's label. As a result, we cannot guarantee that the information on our website is 100% accurate and current. In addition, the product images displayed on our site are for reference only and may not reflect the most current packaging. When precise nutritional information is important, our data is not a substitute for reading the label on the products you purchase or for contacting the manufacturer. There will often be a delay between the time when a new product becomes available and the time when its nutritional information becomes available on our website. If you have any questions regarding a certain product or products please contact the manufacturer(s) directly. Lower mist spray. Lower VOC formula (versus previous Endust. VOC: Volatile Organic Compound). Less mist. Improved air quality. Quick dusting. Natural shine. Lower mist spray (Versus previous Endust. VOC: Volatile Organic Compound) reduces breathing of bothersome mist. Lower VOC formula Versus previous Endust. VOC: Volatile Organic Compound) results in less indoor air pollution for improved air quality. Endust fast-acting formula quickly removes dust, allergens, fingerprints and smudges to leave a natural shine! Effective cleaning removes even crayon and grease marks. Provides an even, consistent shine without buffing. No-wax formula leaves no waxy residue build-up. Refreshing lemon fragrance. 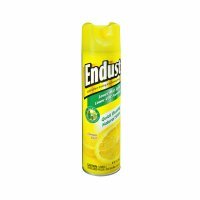 Multi-Surface Convenience: Endust unique formula with no wax works just about anywhere dust collects, including non-wood surfaces: all furniture; cabinets/counters; paneling/window sills; floors; non-fabric blinds; dashboards. Contains no chlorofluorocarbons (CFCs). Shake well before using. To dust and clean furniture and other surfaces, hold container upright and spray the surface from about 8 inches away. Wipe immediately with a soft, clean cloth. If the finish is old or unknown, first test on an inconspicuous area. Wipe up any product that falls to the floor during spraying. For floors, spray Endust onto a dust mop (do not spray directly onto floor), dust thoroughly and allow the floor to dry to keep it from becoming slippery. To completely empty this can, be sure to always shake it well before using. Removes up to 84% of allergens in dust (from pet dander and dust mites). Renew, shine, condition. No wax. No buildup. Clean to reveal the natural beauty and shine! Cleans and removes dust, dirt, smudges, and common allergens in dust from dust mites, pet dander, and pollen. Protects from water spills and stains. No wax formula, no residue build-up. Safe for use on all finished, sealed woods. Did you know Pledge is also great for a clean shine on: stainless steel; leather; marble; granite. Contains no CFCs which deplete the ozone layer. No CFCs. 7 inches x 10 inches. Pre-moistened wipes. Natural beauty. Removes 84% of allergens (Common allergens from pet dander and dust mites in dust). Shine, restore, refresh. Natural beauty every time you dust! Removes dust, dirt, smudges, and common allergens in dust from pet dander and pollen. Protects from water spills and stains. No wax formula, no residue build-up. Trusted for over 100 years. Protective shield formula. Helps protect from everyday wear & tear. Old English Aerosol spray goes beyond cleaning and dusting to help protect wood from everyday wear and tear. Protective shield formula: helps protect against watermarks and stains (mustard, wax candle and crayon)); cleans, dusts and shines to bring out wood's natural beauty; non-greasy, no residue build-up. Old English Aerosol is specially formulated to clean and help protect all light and dark wood surfaces throughout your home, including: kitchen cabinets; wood furniture; wood paneling. Contains no phosphates. Made in Canada. Pledge Extra Moisturizing Furniture Spray.SC Johnson.A family company.Dust, condition, nourish, shine.Moisturizers nurture wood and enhance its natural beauty.3x better removal of dust & messes*. *vs dry cloth. Pledge Multi Surface Wipes Fresh Citrus.SC Johnson - A family company since 1886. 3x Better removal of dust & messes*.Everyday cleaner. Granite + Metal + Wood + Glass + Electronics. 25 Pre-Moistener wipes 7 in x 8 in (17.7 cm x 20.3 cm). Shine, restore, refresh. No wax. No buildup. Removes up to 84% of allergens in dust (From pet dander and dust mites). Natural beauty every time you dust! Removes dust, dirt, smudges, and common allergens in dust from pet dander and pollen. Protects from water spills and stains. No wax formula, no residue build-up. Safe for use on all finished sealed woods. Did you know Pledge is also great for a clean shine on: stainless steel; leather; marble; granite. Contains no CFCs which deplete the ozone layer. Johnson's Head-to-Toe Wash & Shampoo. For newborn babies. This ultra-mild cleanser for sensitive skin & hair. Tested with pediatricians. It contains no parabens, phthalates, sulfates or dyes. Soothes dry, itchy skin. Made with natural ingredients. Formulated with parabens & phthalates. Contains 100% natural extracts dermatologist tested. Wrap your skin in soothing hydration with this ultra-moisturizing St. Ives Oatmeal & Shea Butter Body Wash. This rich and creamy formula, containing nourishing oatmeal and conditioning shea butter, creates a gentle lather that helps clean and soothe dry, itchy skin. Use daily with St. Ives Soothing Oatmeal & Shea Butter Body Lotion to achieve the soft, smooth and healthy look and feel that your skin deserves! Our Beauty Philosophy: St. Ives is dedicated to bringing you the best of nature with formulas that delight the senses and they work. We understand that little everyday choices we make can impact overall quality of life. That's why St. Ives is a conscientious formulator of quality products. Not tested on animals. Does not contain animal ingredients. Made in USA. Custom roasted for full flavor. Makes up to 90 6 fl oz cups. Remarkably rich & perfectly balanced. Original Roast is a deliciously rich and balanced coffee, perfect for every morning. We start with the highest quality beans and then custom roast each bean to its peak for a full flavored taste. Our specially designed flavor lock lid helps seal in freshness. All so that your Maxwell House is always good to the last drop. Great taste, cup after cup! Breyers Natural Strawberry Ice Cream.Made with sun-ripened strawberries.No artificial growth hormones used on cows.Our milk & cream promise.See side panel for more information.Per 1/2 cup serving:110 calories.3g sat fat, 15% DV.30mg sodium, 1% DV.14g sugars. Enjoy your favorite dips one scoop at a time with Fritos Scoops Corn Chips. Fritos Scoops Corn Chips are shaped perfectly for dipping and are sturdy enough for even the heartiest of dips and toppings. Made with just three ingredients: corn, salt and oil; each bite is a reminder how great the smallest things can be. A rich & satisfying robust tea, traditionally blended with Kenyan & Assam black teas. Medium flavour strength. Individually wrapped tea bags. Classics: Traditional style black teas blended for exceptional flavour. Twinings English Breakfast Tea was originally blended to complement the traditional, hearty English Breakfast, from which its name derives. The refreshing and invigorating flavour makes English Breakfast one of the most popular black teas to drink at any time or occasion - not just for breakfast. USDA Organic. The seven whole grain company. Bountifully delicious organic whole wheat biscuits baked with cinnamon and natural sweetness. The warm, spicy scent of organic cinnamon will flood your senses when you open the box. Woven into the center of our organic wheat biscuits is a fusion of cinnamon and organic evaporated cane juice crystals - a true taste experience you'll enjoy balanced with the goodness of over 20% of your daily value for fiber.